I was first certified in 1976 in Monterey, California. What made you want to become a diver? I grew up watching Jacques Cousteau and Lloyd Bridge’s Sea Huntso it was always in the back of my mind. But the moment I took my first breath underwater in the pool in the Bay Area during my open water class, I was hooked. I still remember that moment and the first time I swam at age 7. I’m still an avid swimmer; I swim about seven and a half miles (12km) a week. I love water! How long have you been a diving writer? Ha! I started my writing career with diving. I wrote my first piece about a diving citizen-science group I was involved with called the Cordell Expedition in 1988. The group was doing bio-surveys of the deep-sea mounts off the central California coast. We were making relative deep, decompression dives to about 165 ft (50m)—the D-Words!—and I couldn’t find a diving publication who would publish my story. Editors told me you are NOT supposed to do that. Eventually Ken Loyst, publisher of Discover Diving magazine ran the piece. It was 1988. I was hungry for information about this kind of diving but there was little available so I started aquaCORPS: The Journal for Technical Diving (1990-1996). And then went on to start the original Tek.Conferences and later Rebreather Forum 1 & 2, which helped facilitate the emergence of technical diving. Broke my heart when we went out of business. I have been writing about diving ever since. What does diving mean to you? I ask myself that question sometimes. God knows that there isn’t any money in it (I write about technology and cyber-security stuff to pay the bills!) But diving has so many elements that fascinate me. It encompasses adventure and exploration, science and geeky stuff, cool technology, physical fitness, human spirit, and a big magical dollop of blue zazen. How can you go wrong with that? I’m hooked. Locally my go-to buddy would be my friend Bill Kibbett who’s a GUE Tech 2 diver. Getting closer to the surface, my swim buddy is Wanda Bogin, aka “Fish”. Ghost fishing activist Heather Hamza’s vegan cupcakes of course! You coined the term “technical diving”. How did you arrive at this terminology, and did its industry adoption surprise you? In the first issue of aquaCORPS we featured an article by Dr. Bill Hamilton titled, “Call It High-Tech Diving.” We also referred to it as “advanced” diving” and “professional sports” diving, a moniker invented by marine biologist and early rebreather pioneer Dr. Walter Stark, who invented the Electrolung. At the time, we didn’t really know what to call this new form of sport diving; none of the names seemed to work. It was also clear that we needed to distinguish it as separate and distinct from recreational diving. 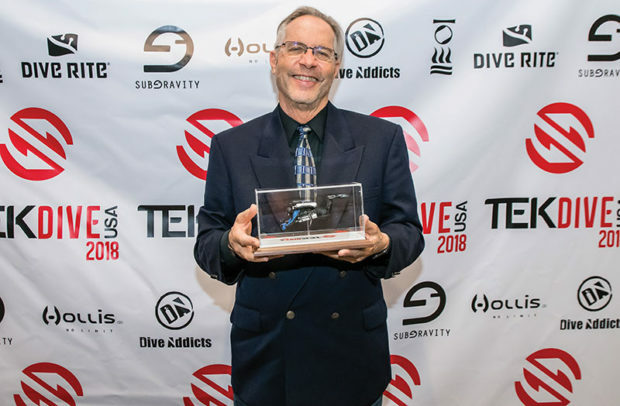 The recreational diving industry was not happy that deep and decompression diving—the “D-Words”—were out of the closet and they didn’t want to have anything to do with what was emerging. They were concerned that an increase in fatalities would trigger the U.S. government to intervene and remove the recreational diving industry’s exemption from Occupational Safety & Health Administration (OSHA) standards. Later that year, Drew Richardson, then a vice president at PADI, penned an editorial, “Technical Diving—Does PADI Have Its Head In The Sand?” for PADI’s Undersea Journal. His article helped give our community legitimacy and the name stuck! I was pretty happy about that. Proudest diving moment or achievement? From the beginning our focus at aquaCORPS was improving diving safety, which enabled us to increase our performance. I am reminded of retired U.S Navy Master Diver Sam Huff explanation of the Navy Experimental Diving Unit’s mission: “We make our divers safer so they can go deeper and stay longer.” That is what aquaCORPS and the TEK.Conferences were all about, and I am proud of it. We saved lives. Beginning with aquaCORPS #5 BENT, we ran an incident report on every tech diving fatality that occurred. I think there was a total of 48 from 1993-1996. I personally did the reporting on all, except cave explorer Sheck Exley’s death, which was reported by Dr. Bill Hamilton, Jim Bowden, and Dr. Ann Kristovich. They were sobering and the ‘most read’ section of the magazine. I was also proud to help bring the sport, commercial, scientific, and military diving communities together for the first time at the TEK.Conference. Heady stuff. I like to think of myself as a community organizer. We are an extraordinary tribe. More swimming and diving of course! I have just gotten into freediving which I absolutely love. I also recently got re-certified as a (open circuit) full cave diver and sometime soon I want to get back on my rebreather. Now that I am getting long of tooth, I have decided that I want to spend the majority of my time doing water-related activities. I just haven’t figured out how to pay for it yet!